Béjoint, Henri (2000). Modern Lexicography. Oxford University Press. ISBN 0-19-829951-6. Bergenholtz, H., Nielsen, S., Tarp, S., ed (2009). 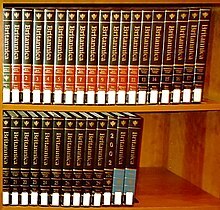 Lexicography at a Crossroads: Dictionaries and Encyclopedias Today, Lexicographical Tools Tomorrow. Peter Lang. ISBN 978-3-03911-799-4. Cowie, Anthony Paul (2009). The Oxford History of English Lexicography, Volume I. Oxford University Press. ISBN 0-415-14143-5. http://books.google.com/?id=nhnVF9Or_wMC&printsec=frontcover&q. Retrieved August 17, 2010. Darnton, Robert (1979). The business of enlightenment : a publishing history of the Encyclopédie, 1775–1800. Cambridge: Belknap Press. ISBN 0-674-08785-2. Hartmann, R. R. K.; James, Gregory; Gregory James (1998). Dictionary of Lexicography. Routledge. ISBN 0-415-14143-5. http://books.google.com/?id=49NZ12icE-QC&pg=PA49&dq=%22encyclopedic+dictionary%22%2Bencyclopedia&q=%22encyclopedic%20dictionary%22%2Bencyclopedia. Retrieved July 27, 2010. Kafker, Frank A., ed (1981). 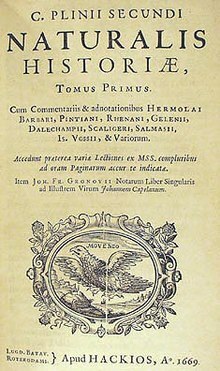 Notable encyclopedias of the seventeenth and eighteenth centuries: nine predecessors of the Encyclopédie. Oxford: Voltaire Foundation. ISBN 978-0-7294-0256-9. OCLC 10645788. Kafker, Frank A., ed (1994). Notable encyclopedias of the late eighteenth century: eleven successors of the Encyclopédie. Oxford: Voltaire Foundation. ISBN 978-0-7294-0467-9. OCLC 30787125. Needham, Joseph (1986). "Part 7, Military Technology; the Gunpowder Epic". Science and Civilization in China. 5 – Chemistry and Chemical Technology. Taipei: Caves Books Ltd.. ISBN 978-0-521-30358-3. OCLC 59245877. Rosenzweig, Roy (June 2006). "Can History Be Open Source? Wikipedia and the Future of the Past". Journal of American History 93 (1): 117–46. doi:10.2307/4486062. ISSN 1945-2314. http://chnm.gmu.edu/essays-on-history-new-media/essays/?essayid=42. Sideris, Athanasios (2006). "The Encyclopedic Concept in the Web Era", in Ioannides M., Arnold D., Niccolucci F. and K. Mania (eds. ), The e-volution of Information Communication Technology in Cultural Heritage. Where Hi-Tech Touches teh Past: Risks and Challenges for the 21st Century. VAST 2006, Epoch, Budapest, pp. 192–197. ISBN 963-8046-74-0. Yeo, Richard R. (2001). Encyclopaedic visions : scientific dictionaries and enlightenment culture. Cambridge, New York: Cambridge University Press. ISBN 978-0-521-65191-2. OCLC 45828872. http://www.cambridge.org/us/academic/subjects/history/history-ideas-and-intellectual-history/encyclopaedic-visions-scientific-dictionaries-and-enlightenment-culture?format=HB.